this synth is the second one based on valves, (after the Metasonix S1000, Wretch Machine Analog Synthesizer). 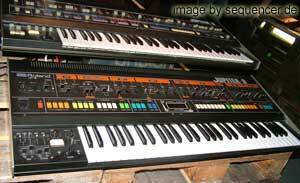 der jetzt zweite Synthesizer mit Röhren Technik. Shortly: Oscillators, ring modulator, mixer, moog type filter, noise source, Vari Mu type VCA and output amp are tube units. Everything else is IC and some discrete. Don’t ask for schematics, I spent full three months on the circuits alone. Tuning systems can be changed with small plug in boards. Oscillators have saw, triangle, pulse and very crude sine. There is sync and FM modulation. Keyboard will have after touch but not dynamics. Three octaves of keys, in imitation ivory and imitation tortoise shell. via: Forum • Knifonium – der Röhren Synth. Let me drop in and clarify some things, the concept, my thinking and some techinical details for those who understand English. I understand German pretty well, but don’t want to humiliate myself trying to write it, sorry. It would look terrible. First of all, tubes are super stable compared to solid stated devides when it comes to temperature drift. Typical tube originated tuning drift in Knifonium at 440Hz is 2Hz per hour after initial warm up period. On strictly component level typical triode will change transconductance much less than a fet or transistor when temperature changes. Long time aging effects are of course much more important in tubes. Solid state devices stabilize after a couple of days, and only break. Tubes slowly get weaker and weaker. I have now kept the synth on for a couple of months, and can not note any aging effects so far, but they will eventually appear. Then you just change tubes. Noise? What? Yes, I have a noise generator there, an old concept where you place a strong magnetic field on a thyratron tube. Makes very fine white noise. Othervise this thing is dead silent, no humm, no buzz, no noise if not wanted. It is funny that someone here was sceptical about the ring modulator. in fact it is most fun and interesting when done with a primitive diode tubes+transformers topology and in Knifonium it is surely is one of the most effective ways to get sounds with a little bit of something extra. it is NOT the same thing as IC based state modern ring mod or transformers + diodes topology, they all have their own uses and sounds. IC thingies are the mathematically most perfect and most boring etc. My past includes a lot of cembalo playing and building, formal „classical composition“ and instrument acoustics. That and many other things made me want to specifically create something *I* like, a very „traditional“ synth, but with more personality and versatility than those synths I have used myself, Moog Prodigy and Mini Moog. Fine synths, but still not quite there. My main job is to build mastering gear, and that stuff I like to keep absolutely neutral, so it was super fun to let things really get out of controll in the synth. I have not used tubes in such parts that would not make any difference, all controll electronics is IC based, and I have even put a couple of semiconductors along tubes where they make no difference. It is impossible to hear from the crude first clips what it really means to have a proper tube VCA (not some crude single tube piece of crap, but complex variable mu VCA with transformers). It reacts in a very different way to different signal levels, and the distortions produced can not be simulated with just putting a tube amp after some normal synth. You might not believe it, but Moog filter is very easy (well, easy if you understand how to…) to make with tubes, and it works beautifully. And still, because the non linearities are quite different and there is broader over load margin it will sound different. Same applies to oscillators, the waveforms are very different than from typical solid state oscillators. There is a lot of „iron“ on the signal path, i.e. a lot of transformers. This is not to be overlooked. They produce a lot of different low frequency saturation distortions and most importantly the way magnetic iron works creates a „thickening“ effect to sounds, this is probably due to Barkhausen effect, „barkhausen noise“. No doubt many of the subtleties are not to be heard by some people, but make no mistake, difference there is. I have no special needs to brag about the project, I will only manufacture 6 units next year, (I have my mastering gear business to take care of) and those 6 units will be sold in no time. There are now 2 or 3 sold, so if interested, you got to hurry. BUT I do want to make it known that I am not a person to build something based on improper knowledge or non-experience or dubious motivation. But surely I am *a bit* crazy, this was huge work! And yes, of course esthetics played a part in the motivation. Weiter Hands on Synthsound – Lern DVD – 3. Auflage bereit – auch für iPads, Download und klassisch auf DVD..
2 OSCs pwm sync Xmod, 2 LFOs, 2 EGs, 2 FILTERs (2-4pole), no sequencer, arpeggiator more..